Film and television editors are a rare breed. I got to know them well when I first went into television as the foreign editor of the Seven Network in Sydney in the early 1980s. I had been a journalist for The Australian newspaper for nearly ten years, and I didn’t know a grab from an outcue or a live voiceover from a news package. I was thrown into the deep end in a little office in the Epping newsroom in northwest Sydney. How did I survive? The editors, of course. Every week I had a different editor, from Paul Steindl to Ken Moore to Richard Frecker to Ian Becker to Peta Dann to Merryn Cooper to Sonia Hillenberg to Sonia Lenarcic et al. They taught me everything I needed to know about what works on television, including natural sound and pieces to camera and how to cut a 2 minute story down to 49 seconds and still make sense out of it. Thirty plus years later, I still love editors, including all those I worked with on Seven, the Nine Sunday Program, Sky News Australia, Ten’s Meet the Press, Shine Australia, and SBS’s The Observer Effect – too many to mention them all here. But they were the best, and without them, many television shows would have never made it to air. Packed into the smallish lounge and overflowing into the Bistro were about 100 people, family, friends and colleagues. 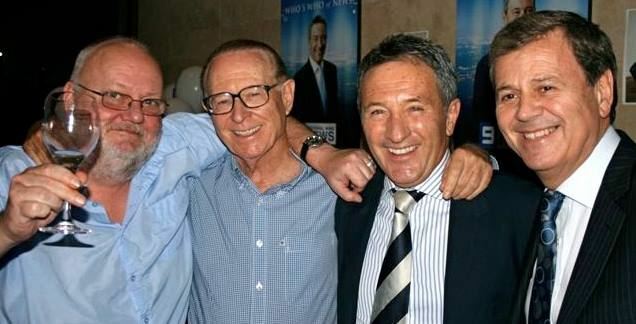 As Damian Ryan put it, there were three families there: those family members who had come from Victoria, Queensland, Canberra and the Northern Territory, the Channel Nine contingent he worked with, and the Bridgeview mob who he drank with at the Nine pub a few blocks away. Hardly anybody from Nine drinks there now – there isn’t time, it seems. Looking around the room as I introduced each guest speaker and film clips cut by a great Nine editor, Paul Luxford, I could see Slam’s mates and colleagues: Hugh Riminton, now a Ten news presenter, Ken Sutcliffe, sports presenter; Simon Bouda, Nine News reporter; Megan Purcell, former Nine editor; Paul Steindl, former Executive Producer, Sunday Program and The Observer Effect; Mary Davison, Executive Producer, Nine News; and Sean Costello, Director, Big Day Media, to name just a few. Finally, the veteran reporter Damian Ryan talked about their days together in the London bureau, and how they got quite close. They would chew the fat, order a pizza and wait for the foreign editor, David McCombe, to call the story from Sydney. One of the biggest stories they worked on was the Interlaken canyoning disaster in Switzerland where 21 people, including 14 Australians, lost their lives. Damian was part of the team that won a Walkley award for their coverage, but he said: “Slam should have won an award for that. He was incredible.” Damo said things had changed in television now. It had become a sausage factory, but “Slam was old school, he was meticulous. He was packing his packages with all the best shots and natural sound to produce something the viewers would watch and leave them pondering long after the news.” He became a bit emotional talking about his former editor: “He could be gruff, he could be obnoxious, but he was a very soft, very sensitive guy. I have one major regret. I did lose touch. But I rejoice in the fact that I spent a lot of bloody good times with him.” It was a poignant moment when we all realised how much we missed Slam. We had all lost touch. Here we were at Channel Nine, which he loved, and where he was much loved, and he wasn’t here to see it. But all three of his families were here, and we saluted him as he gave us the finger in the last shot in the closing montage, with music by Supertramp: Give a Little Bit. Yes, there were tears, too. 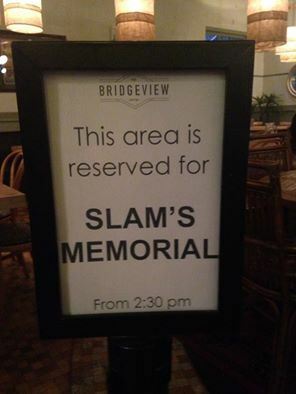 We retired to the Bridgey where more war stories were told about the remarkable Slam McQueen. I was proud to be one, Slam. Thanks for the memories. I was so sad to hear of Slam’s passing. Thank you for a beautiful report, it certainly did him justice.